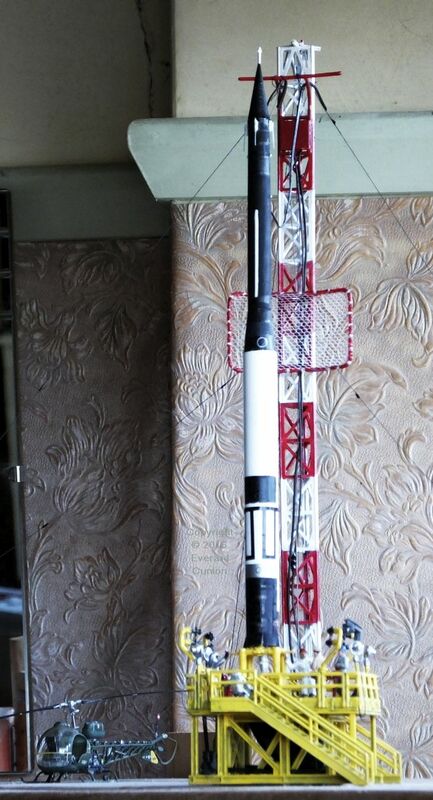 From the surface of my kitchen table to the top of the launch tower is 14 inches. 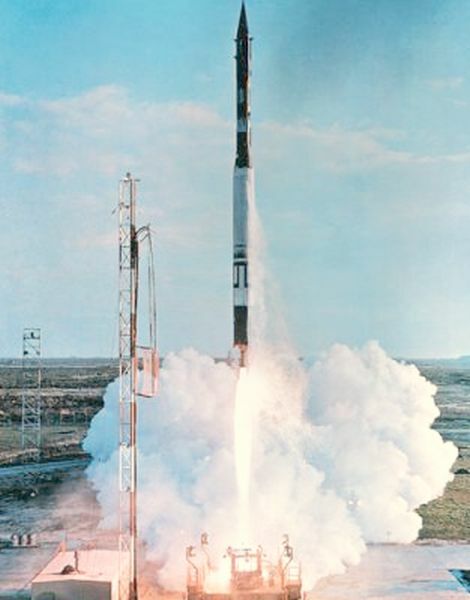 Two months after Sputnik 1 the Navy tried to launch the first American satellite with a Vanguard rocket. The first nationally televised countdown began…, “Ten, nine, eight…” Then… “Ignition!” A mighty surge of noise and flames. The rocket lifts—some six inches. The first stage, bloated with fuel, explodes, and the rest of the rocket sinks into the sand beside the launch platform. 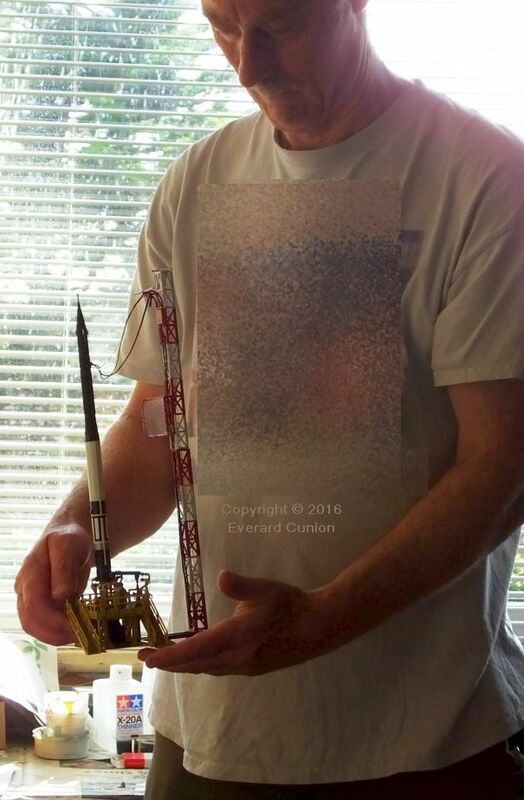 I rarely build space models because they usually do not look anything like the real thing — in my experience. However, when I came across photos of the Glencoe Models Vanguard, I had to build one. Because it is a small model of a large and complex object with small parts, it cannot be completely accurate. For example, the railings around the platform and stairways are too thick. If they were to scale in thickness, they would be too fragile to remove from the runner (‘sprue’) and to build without breaking – if they could be moulded at all. However, unless you compare the model with photos of the real thing, which most viewers of the model are unlikely to do, you are unlikely to notice that shortcoming. 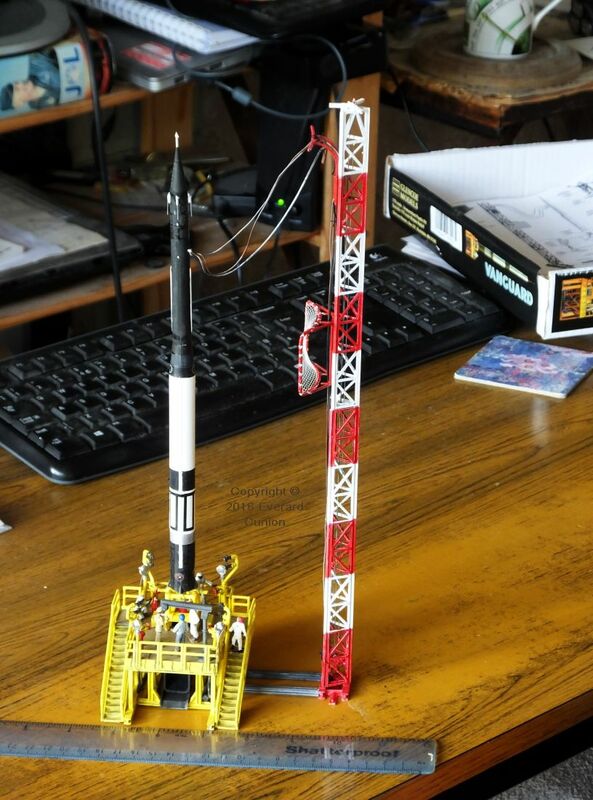 It is not a hard kit to build for an experienced modeler, but it is unsuitable for a beginner. 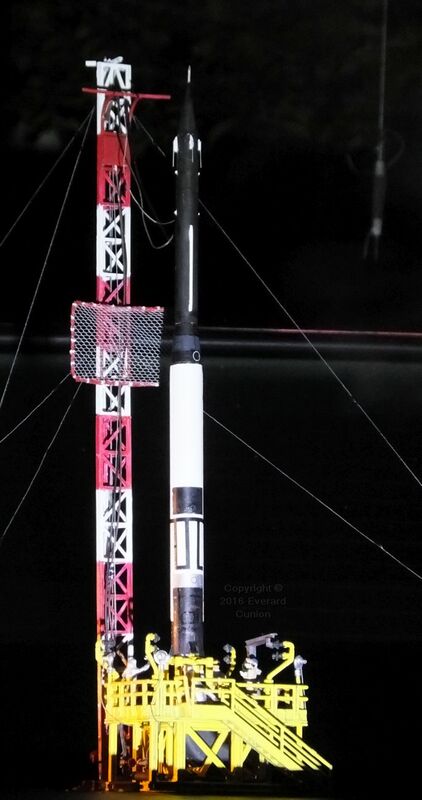 For example, the six panels of the lattice-work launch tower look all alike at a glance, but each is unique. They have their part numbers on little tabs added between struts. In mine, some had fallen off, so I pored over the instructions to identify which panel was which by differences in the lattice and some tiny details unique to particular panels. I then wrote the part numbers on white tapes and stuck them to the adjacent runners. To glue the panels together, for which of course you remove them from the runners and, therefore, from their white tape labels, I first placed each on its drawing in the instruction sheet so as to retain its identity prior to picking up my glue with one hand and the panel in the other. The drawings are to the roughly same scale as those parts, so it seems likely that was the intention. Follow the instructions. Their printing is rough and ready, but it is a well thought out kit! The Vanguard took me the equivalent of roughly three or four full days – spread over three weekends and about ten early weekday evenings – to paint, build, and paint. Paint the parts, build the model, then retouch and repaint where necessary. Note: Assembly diagrams 1 and 2 in the printed instructions are upside-down (deliberately). The base plate’s upper surface (for walking on) is the underside in the drawing. Get that wrong, as I did initially, and you will search in vain for the locating holes in the base plate. When this assembly is completed, you turn it over to right it. In other words, the curved exhaust channel emerges down from the base plate, which is raised above ground level by girders. Turn the page to the next assembly diagrams (3 and 4) to see it the right way up. Tip: If you use runner from this kit to make ‘stretched sprue’, use the white plastic, not the grey. The molten grey just breaks when you pull it apart. Like I said, this is not a suitable kit for a beginner. I am still fairly new to acrylic paints (acrylic white is much purer than enamel white) and I used them for this model except in odd places where I had only enamel paint of a particular required colour. 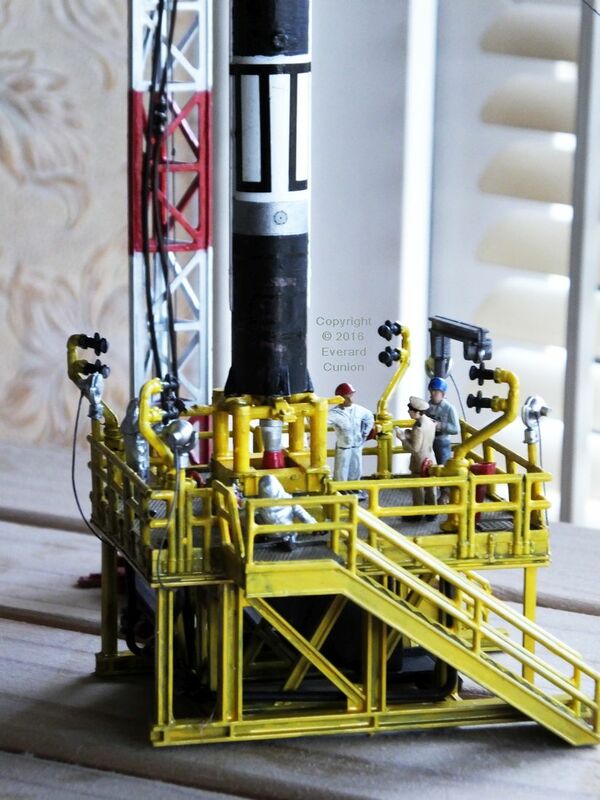 I built mine with floodlight cables made of thread, lines running up inside the tower also made of thread, a couple of extra guys in hard hats (US soldiers, whose origin I do not recall) and a fire extinguisher from a 1/72nd scale set of modern US Navy aircrew and ground crew. I used a heavy sewing needle as a weight to thread the lines running up inside the tower. (Tie the thread to the needle temporarily.) The tower consists of two segments (each of three panels) glued end-to-end. That mid-way joint is clearly a potential weak point. The internal lines, secured with knots at top and bottom, strengthen the whole tower. The model rocket can be lifted off its base and it comes apart to show off the three engines, which in this scale are tiny. My only other deviation from the plans, apart from where photos show different colours from the instructions in a few places, is that the instructions call for one of the two men in protective suits to be green. (The other guy wears a silver suit.) Green? I painted both in silver. A colour film by the prime manufacturer of the Vanguard, Martin Aircraft Engineering Division, shows several mix-and-not-match colours of these suits. They consist of several parts including an integral helmet-shoulder-upper-torso unit, reminiscent of a very old diving suit. 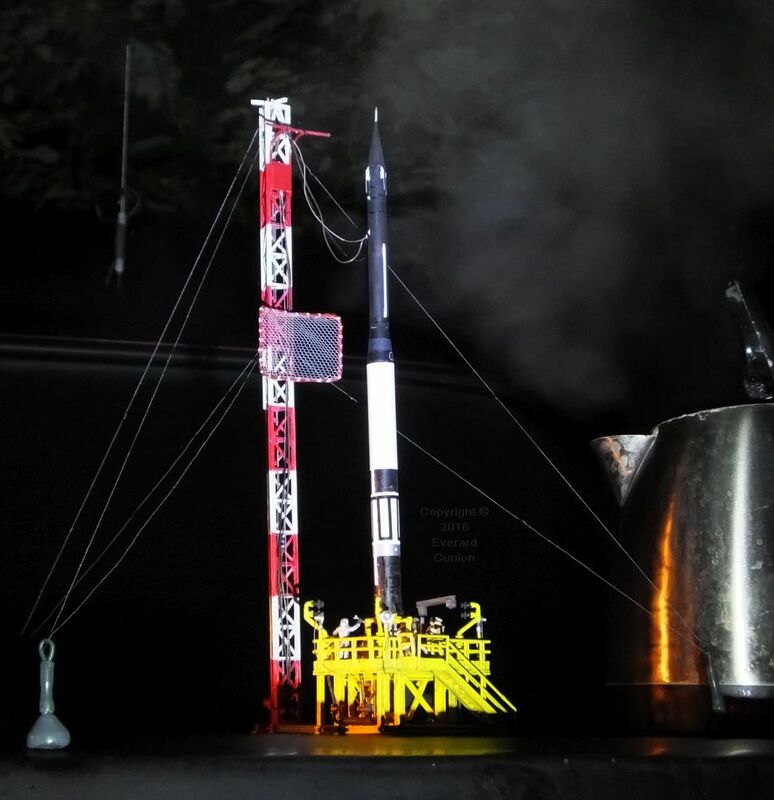 In addition, the instructions suggest you make a mesh screen from ‘black thread, thin wire, or stretched sprue.’ That mesh screen prevents the fuel line ends from striking the tower when they are disconnected and fall away from the rocket on launch. Photos show that it was white or light grey, certainly not black. In the NASA photo here the screen is the rectangular frame half way up the tower, although the mesh it surrounds is hardly visible. I do not know what it was made of, but it has the compound curvature of fabric. I made mine out of white fine tulle mosquito netting I bought via the fabrics section of eBay. The mesh screen half way up the tower is made of white fine tulle mosquito netting. I added cable stays from the tower to the ground using cotton thread held taught by their ends being attached to fishing weights that sit on the ground (or on my model shelf). That way, the whole model can be moved easily (well, it can be moved…) yet the tower appears anchored in place when you set the weighted ‘wires’ out at full stretch. Although the weights are larger than I would like, they are fairly inconspicuous and well away from the center of attention. The turnbuckles are blobs of Bostik (a general purpose glue in Britain) painted matt black. The floodlights in the model do not actually work. I used two hand-held flashlights for the night photo. The model was set up on the trunk of a car. You might make out the dew-coated rear window and that is an aerial at upper left. The kettle is for steam and one of the fishing weights anchoring the stays is at left. Incidentally, I read that the mainly black and white rocket colour scheme, which carried through to the Apollo moon landings and beyond, was not primarily designed to facilitate observation of the rocket’s orientation in flight when viewed through telescopes from the ground. Rather, it was a scheme imposed by NASA’s chief rocket engineer Werner von Strangelove because he liked it. Apparently the US Navy (the Vanguard was a Navy-managed research program) or the engineers at Martin Aircraft – or whoever decided on the paint scheme – conformed to that convention. The inscription on the underside of the platform base reads ADAMS action MODELS © 1958, so it is a Glencoe repackaging of a very old kit. Nevertheless, it is finely moulded with a minimum of flash and well detailed. And everything fits perfectly! The kit folks in kilts at Glencoe were right to re-release it, in my view. As for the real thing, the first one to reach orbit is still in orbit, apparently. My model depicts that example, one of six alternative paint schemes and decal sets provided for in the kit. Shipping to cost me as much as the kit, this Glencoe Models being in the USA, not Scotland. I ordered mine via eBay from BaLLzanos Hobby Warehouse in August 2016 and it arrived at my home in England ten days later.